Should steroids be used for urticaria? Today’s article will be a review of a topic that was requested on the Medgeeks private Facebook group page. We will be discussing the evaluation and treatment of acute and chronic urticaria. Urticaria is a common skin condition that often manifests with pruritic, well defined, raised wheals that can be millimeters in size to several centimeters.1 These skin lesions are often very irritating, and considerable pruritus can lead to significant distress to a patient. The severity of urticaria varies from case to case. They are frequently benign and can be self-limited, but unfortunately, in some cases, they can be life-threatening and associated with anaphylaxis or angioedema. Urticaria occurs when histamine and other mediators are released from mast cells and basophils. 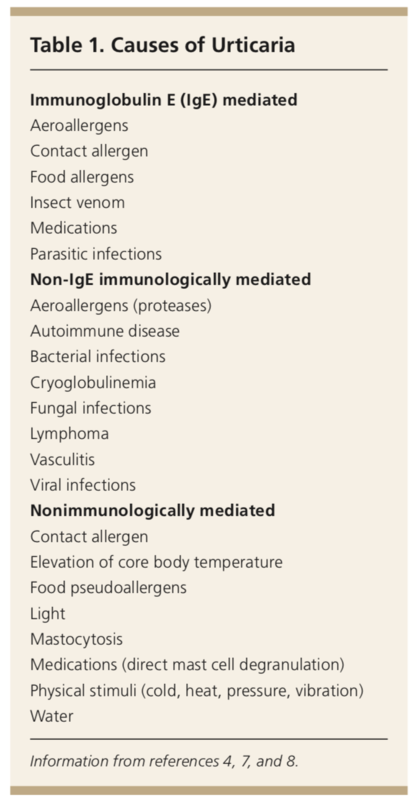 Immunoglobulin E (IgE) will often be the mediator of this release, but non-immunoglobulin E reactions can also occur. A non-immunoglobulin E mediated reaction has been hypothesized in which “proteases from aeroallergens and activation of the complement system have been proposed as potential triggers.” (AFP, Acute and Chronic Urticaria: Evaluation and Treatment). There is a myriad of etiologies for urticaria that have been found. Common causes include medications, allergens, infection, foods, and insects. Infections are the most common cause in children with viruses such as rotavirus, rhinovirus, hepatitis A, B, or C, Epstein-Barr virus, HIV, or herpes simplex. In some cases, direct stimuli including pressure, heat, or cold can lead to chronic urticaria. Systemic illness is a less likely etiology, but diseases such as Hashimoto’s thyroiditis, lupus, mastocytosis, rheumatoid arthritis, vasculitis, Sjogren syndrome, celiac disease, or lymphoma have been found as known etiologies. 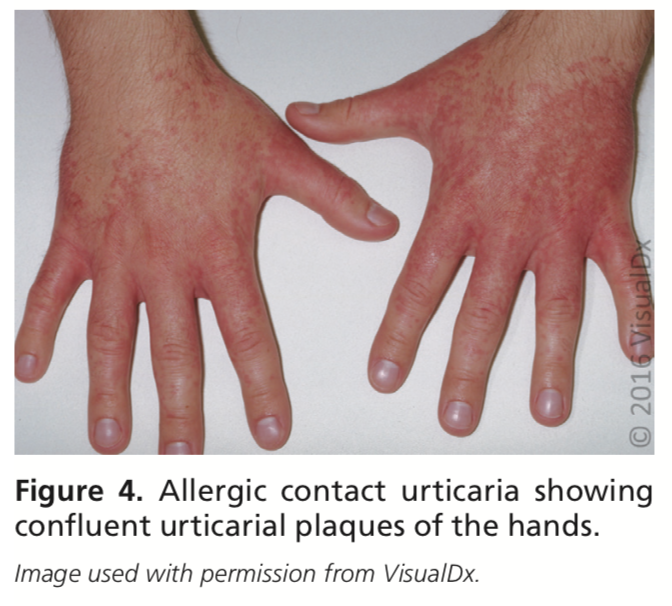 The diagnosis of urticaria is clinical based on the appearance. However, the evaluation and workup can be in depth in some instances. The first step, just as with all complaints, should be taking a good history and physical examination. Significant history features to ask about include the onset, associated symptoms, location, severity, medications, food or hygiene product changes, environmental triggers, allergies, recent travel, recent infection or illness, and family history of similar rashes. A complete review of systems should be completed as well, because this may hit on a symptom that could lead you to a systemic illness that may be manifesting as urticaria. Sexual history, blood transfusion history, and illicit drug abuse history can elucidate information on infectious etiologies. Examination of ears, eyes, nose, throat, lymph nodes, abdomen, and musculoskeletal system may show findings consistent with systemic disease contributing to the skin lesions. The most important thing to rule out during the history and physical examination is anaphylaxis. Symptoms including wheezing, stridor, tachycardia, hypotension, diarrhea, nausea, vomiting, abdominal pain, or dizziness can be concerning in the evaluation. Laboratory workup should be completed based on the history and physical exam findings. This testing would be looking for a chronic illness that could be causing the patients rash. For example, if a patient had symptoms of vasculitis, a skin biopsy may be warranted. If the history has concerns of an allergic component, then referral for allergy testing may be indicated. For chronic nonspecific urticaria, a limited initial workup including a CBC with differential, CMP, ESR, CRP, and TSH may be considered. If history suggests an infectious etiology, additional testing may be including such as HIV, RPR, and hepatitis panel. If no trigger is identified or if the specific trigger is unable to be avoided symptom relief with antihistamines are first line. These include second-generation antihistamines, loratadine (Claritin), fexofenadine (Allegra), desloratadine (Clarinex), levocetirizine (Xyzal), or cetirizine (Zyrtec). First generation antihistamines, diphenhydramine (Benadryl), hydroxyzine, cyproheptadine, or chlorpheniramine are faster acting, but often will be more sedating, and will require more frequent dosing. Other adverse effects that may limit the use of first-generation antihistamines over second-generation include dizziness, confusion, impaired concentration, and anticholinergic side effects. Regarding the dosing of second-generation antihistamines, they will often be titrated up to two to four times the normal dose in cases of acute urticaria. If symptoms are not controlled with second-generation antihistamines, H2 receptor antagonist can be added such as famotidine (Pepcid), cimetidine (Tagamet), or ranitidine (Zantac). In severe cases, prednisone or prednisolone dosed at 0.5 to 1 mg per kg per day can be added for up to 10 days for control of symptoms. If symptoms of anaphylaxis are worrisome in your patient, an EpiPen should be prescribed as well. Regarding the treatment of urticaria, treatment will be in a stepwise algorithm, which often will begin with similar treatment as acute cases, with antihistamines. If second-generation H1 antihistamines do not control symptoms, the next step in treatment may vary. If symptoms are still not controlled, addition and titration of high potency antihistamines such as hydroxyzine or tricyclic antidepressant, doxepin, can be trialed. After this step if still uncontrolled referral to allergy and immunology should be completed. At this point, they may consider treatment with omalizumab (Xolair) or cyclosporine (Sandimmune). Some data has shown some benefit in the use of topical corticosteroids in cases of localized pressure urticaria, but this treatment modality is not often used. Once a patient’s symptoms are under adequate control, step down of the treatment regimen is recommended. At three years 54 percent of cases are in remission, and at five years, 68 percent of cases are resolved. However, even with the resolution of symptoms, some patients may have relapses of symptoms throughout their lives. I hope you enjoyed today’s article on Urticaria. If there are any other topics that you would like to read about let us know! Comment or message us on the Medgeeks Facebook page, Instagram, or send an email. We would love to hear from you! 1. Am Fam Physician. 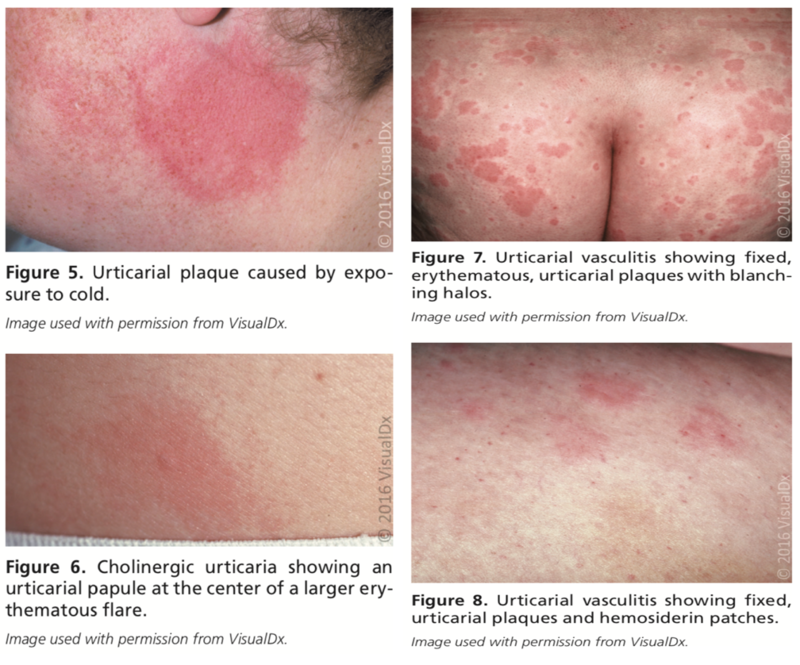 Acute and Chronic Urticaria: Evaluation and Treatment. 2017;95(11):717-724. Copyright 2017 American Academy of Family Physicians. 2. UpToDate. 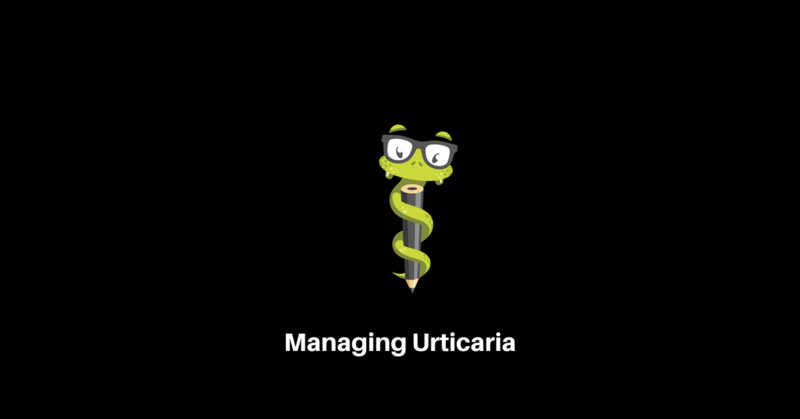 Chronic urticaria: Standard management and patient education. Accessed: May 14, 2018. 3. UpToDate. 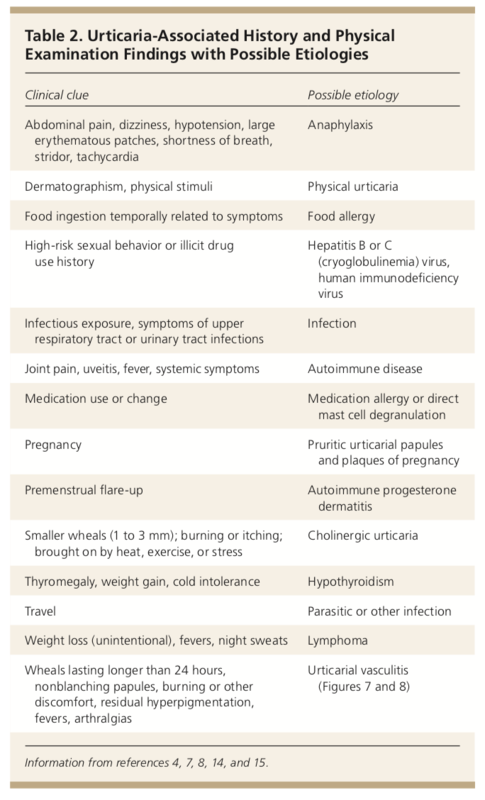 Chronic urticaria: Treatment of refractory symptoms. Accessed: May 14, 2018. 4. UpToDate. New-onset urticaria. Accessed: May 14, 2018.